Since beginning this blog, I have received countless requests to promote various apostolates, Facebook pages, news articles, books, and causes. Many of these are excellent and worthy projects, but due to the volume I receive, I can’t possibly share them all. 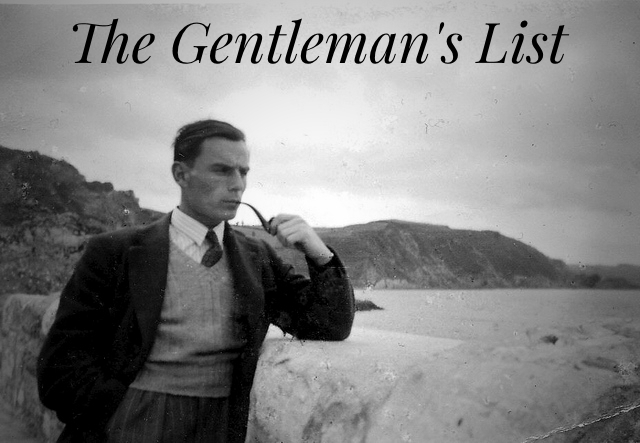 To allow you to promote your projects while not overloading readers with constant promotions, I am launching a weekly post I am calling The Gentleman’s List. Each Monday, I will feature new, hand-selected projects and apostolates that have been submitted by readers. A select number of projects will be featured in a permanent archive on the Catholic Gentleman website. Projects must be Catholic, faithful to the Magisterium, in continuity with tradition, and in line with Catholic moral teaching. Types of projects considered include Facebook pages, books, apostolates, musicians, videos, blogs and blog posts, public speakers, craftsmen, and artists. If your project fits into a category not mentioned, submit it anyway and I’ll see what I can do. Items must be submitted at least the Friday before to be featured on Monday. Priority will be given to projects that are specific to men, thought all will be considered. If you’d like to receive the Gentleman’s List each Monday, as well as get blog posts in your inbox, sign up by clicking here. The first Gentleman’s List will run this Monday. While items normally have to be submitted by Friday, I will accept submissions throughout the weekend. I look forward to seeing what you have to share! Is this a revolving weekly list or a permanent list? Both. There will be a weekly list that is different each week, but I will also be selecting a number of projects to form a permanent list on the website. If someone has the right spirit and skills, he might join my new initiative…. It's Here! Be Not Afraid Quote Book Now Available in Paperback!